Would it possible to create two different player movement systems and switch between them based upon the map the player is currently on? If so, would it be as simple as, maybe using an if conditional to SetUpdateScript or might the two different movement systems cause glitches & movement bugs to occur? It's certainly possible and a simple switching mechanism could be implemented. Seems easily doable. It could be as simple as setting which function to run on every update (aka SetUpdateScript in legacy), determined by a variable. My mind is already churning with ideas for the sequel to P:ZeC and one of the thoughts I had was to create it in the style of Zelda II: The Adventure of Link. With that game the world was a top down map while the levels were side scrolling maps. It would definitely require the 2 seperate movement systems. 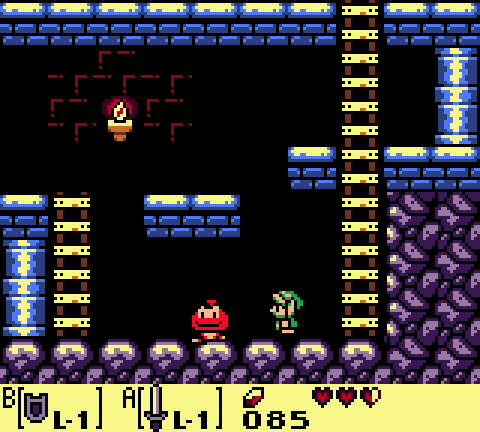 Link's Awakening comes to mind too, with the little underground platforming segments. Link's Awakening to this day is my favorite Zelda game. I have it on my 3DS and I play through the whole game at least once a year. The size of the dungeons and the pacing were both perfect, and the reveal three quarters of the way through the game (no spoilers!) was so well-done that it colored my experience of the remaining 3 dungeons and made them completely unforgettable. I do prefer the original black-and-white version to the colorized DX one though, not only for nostalgia (naturally) but also for reasons largely having to do with the aforementioned spoiler. Some of the atmosphere was lost in the move to full-color. Still an awesome game, though. Slightly early considering I'm still creating ZeC but as an example here's a very early pic. This will be changed, for as in ZeC the landscape will be different. Also, in doing background research into the original games, it was stated that the original japanese version had animated water but when ported over to the US version, Nintendo made the water static and unanimated. As you can see, that is just one thing that will be reimplemented. Note: Many different sites state that the bottom of the map where the hammer is located in Zelda 2 is the area from Zelda, denoted by the cemetary, woods & spectacle rock. 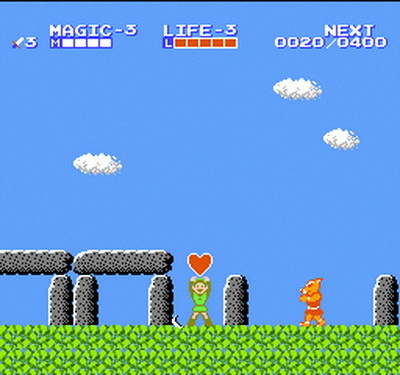 If it is indeed the area from the original Zelda, then the map for ZeC II will reflect that and have a somewhat matching landscape from P:ZeC. I kind of like the unmoving water, having no movement at all gives the overworld a feeling of looking at an actual map, with Link (whose own movements on the overworld are very rigid too) as a marker of sorts. Then you enter a sidescrolling section and everything "comes alive" so to speak. Even when the occasional random encounter enemies pop up it all feels very abstract. Animated water in that context seems unnecessarily distracting. As stated, very early example. I'd like to finish the production of ZeC before I start ZeC II. One of the things I found while researching was this https://www.gamefaqs.com/nes/563487-zelda-ii-the-adventure-of-link/faqs/27747. I wasn't going to base everything off of the differences listed. It isn't difficult to make the water once again static, especially with a dev engine like sphere, but the animated water seemed like an interesting concept.